The Patriot Spark combines exceptional speed and ultra-portability. With the enhanced transfer speed of USB 3.1, Gen. 1 (USB 3.0), the Spark features a micro-sized form factor providing the best solution for those looking for both excellent performance and ultra-light portability. The Patriot Glyde is the perfect choice for those looking for an entry level USB 3.1, Gen. 1 (USB 3.0) flash drive. Stylish and sleek, the Patriot Glyde not only has a modern look, but is also designed for excellent reliability and exceptional performance. Select sales benefit the Make-a-Wish foundation, a well known charity that grants wishes to sick children. Small, stylish, compact, and always ready to go, the Patriot Xporter Pulse delivers excellent transfer speeds. Comes equipped with an all-aluminum housing for best in class protection against damage. New and Unused/unopened however the packaging shows damage. Free shipping. Update your busy lifestyle with The Patriot Slate. The Slate is the perfect solution for having both style and portability to ensure you’ll always look good and have your data while leading a busy lifestyle. Patriot 16GB USB Stick Swivel Quick Drive USB 3.1 Flash Drive Condition is New. Shipped with USPS First Class Package. PATRIOT SUPERSONIC BOOST USB 3.0 8 GB USB FLASH DRIVE. Trending at $10.33eBay determines this price through a machine learned model of the product's sale prices within the last 90 days. Hi Speed USB 3.0 Compatible (backwards compatible to USB 2.0). Easy plug and play functionality. Up to 90MB/sec Read. 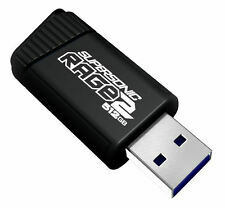 The Patriot Supersonic Rage 2 is the perfect solution for those looking for both an ultra-portable form factor and the high performance transfer speeds of USB 3.0. Designed with a rubberized housing, the Supersonic Rage 2 provides excellent protection against wear and tear. USB 3.0 Port. Shock resistance and Ultra Portable. MAC OS X (10.2.8) and above. Windows 7 / Windows 8. The Patriot Tab is the next generation in speed and ultra-portability. The Tab is plug-and-play compatible and available in 8GB, 16GB, and 32GB capacities, so perfect for carrying your all your data wherever you go. Patriot Memory Slate 128GB USB 3.0 Flash Drive, 5 Pack, Blue Shipped with USPS First Class Package. Each was used once to update a retail kiosk. Tested & Formatted. The buy it now price is for 5 128GB Flash Drives. Manufacturer Part Number: PEF512GSR2USB. The Supersonic Rage 2 carries a 3-year warranty. 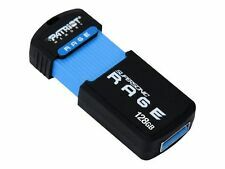 The Patriot Supersonic Rage 2 is the perfect solution for those looking for both an ultra-portable form factor and the high performance transfer speeds of USB 3.0. New Patriot 16 GB flash drive for phone and computer. C connector type. Compatible with Windows 10 and Mac. Storage is untouched. 🔥Patriot Memory 16GB Quick Drive Swivel New 100% Sealed Condition is New. Shipped with USPS First Class Package. Supporting USB 3.0, the new standard in USB flash storage, the Supersonic Boost XT provides superior transfer speeds over USB 2.0 with performance of up to 150MB/s. This extra performance makes the Supersonic Boost XT the perfect choice for large file transfers so you can always have your data in a fast paced, demanding lifestyle. No matter the platform, you can always access your data. Plug-and-play and SuperSpeed USB 3.0 interface. 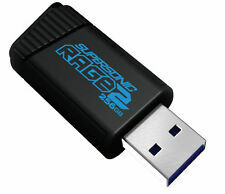 The Patriot Axle USB drive is the ideal solution to transport important data wherever you go. Whether moving or saving your valuable data; Axle is the perfect choice. Hi Speed USB 2.0 Compatible (backwards compatible to USB 1.1). Whether moving or saving your valuable data; Xporter Xporter Plus is the perfect choice. 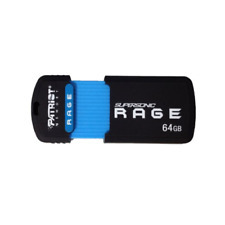 16GB Patriot Xporter Plus. USB Flash Drive. 16GB Xporte Plus USB Flash Drive. Designed with a custom retractable USB housing, the Supersonic Rage XT provides a unique all-in-one slide to connect design for best in class protection from wear and tear. Unleash the power of Windows 8. Product Type: Flash Drive. Host Interface: USB. QUICK OVERVIEW. Storage Capacity: 16 GB. PATRIOT Supersonic. Series: Supersonic. 14 USB Drives of 32GB each. Total = 448GB (15 x 32GB). Capacity: 32GB. Quad-Channel Technology and one of the Fastest USB 3.0 USB Drive! USB Specification: USB 3.0. Hi Speed USB 3.0 Compatible (back wards compatible to USB 2.0). USB Specification. - Easy plug and play functionality. - Up to 140MB/sec transfer. 0.81"(H) x 0.48"(W) x 0.17"(D). Manufacturer Part Number: PEF32GSBUSB. Supporting USB 3.0, the new standard in USB flash storage; the Supersonic Boost XT provides superior transfer speeds over USB 2.0 with performance of up to 150MB/s. Location: Bin 90 in bag x2 per order. What you see in the picture is what you get. Nothing else is included! Have an issue?. Listed by: CG. Why buy through us?. Make sure it is exactly what you are wanting. This is more of a performance product and you will not disappointed by the performance and reliability of this product regardless of whether you're using a USB 3 or USB 2 port. If it's USB C, you will require an adapter. USB 3.0 / Micro USB Connector. Micro USB connector for Android - based smartphones / tablets. USB Specification. USB 3.0 / Connector for PC/Mac. Up to 140MB/s transfer. Portable and light weight (3 grams). Patriot Memory 32GB Pulse Series USB 2.0 Flash Drive - 5 Pack - Silver (PSF32G..